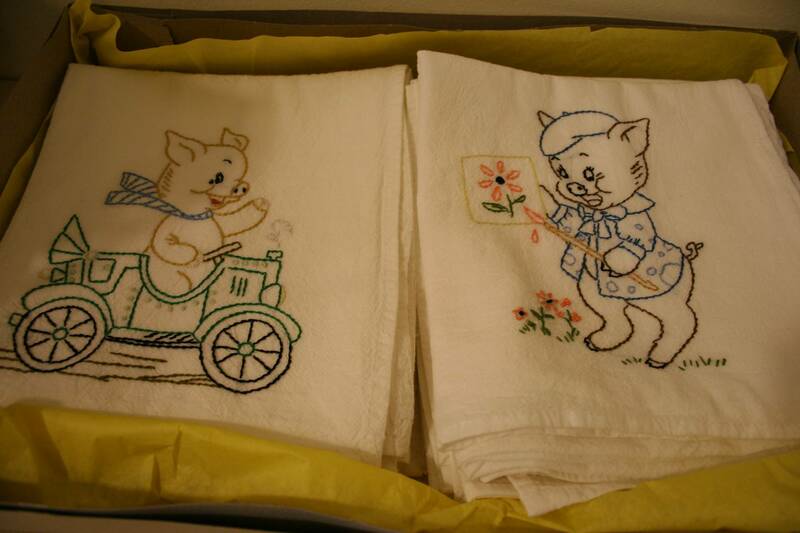 Embroidered dish towels were among silent auction offerings at the Cannon Valley High School event. ‘TIS THE SEASON of fund-raising auctions and church dinners and festivals in Minnesota, and I hit my first one this past weekend in Morristown. My husband, Randy, and I attended Cannon Valley Lutheran High School’s annual auction. Even though we didn’t make any major purchases this year as we have in the past, we still enjoyed a fun Saturday evening of interesting conversation, auction entertainment and great food. 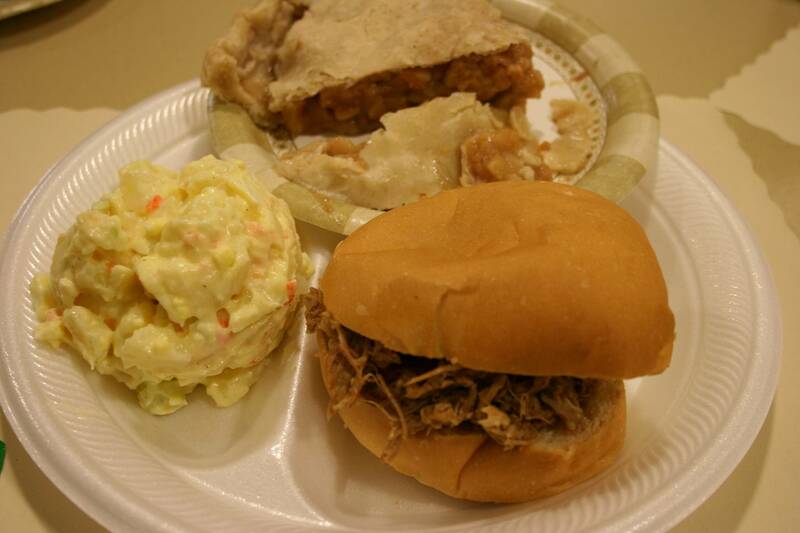 You can't beat the homemade food served at the auction. Did I mention the great food? These Lutherans serve up some fantastic a la carte selections like the pork sandwich, potato salad and slice of homemade apple pie that filled my plate. 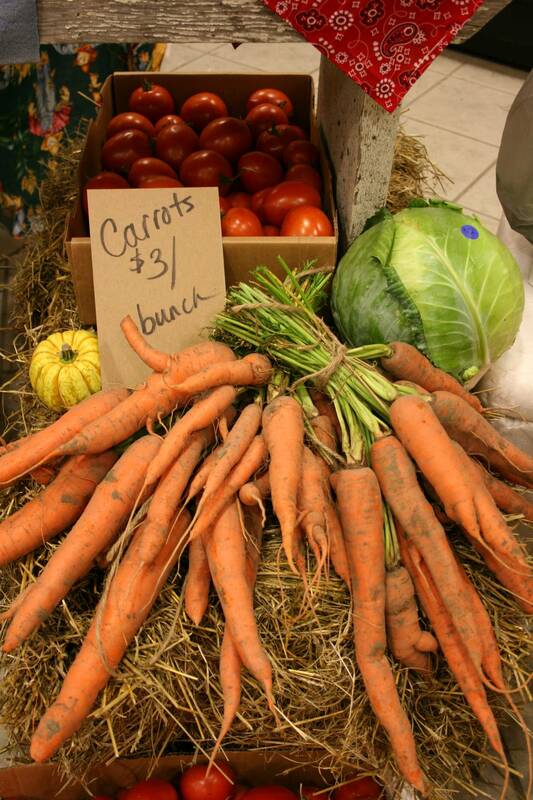 Fresh produce stocked the country store at the CVLHS event. Jars of pickled beets on display. And that’s not all. 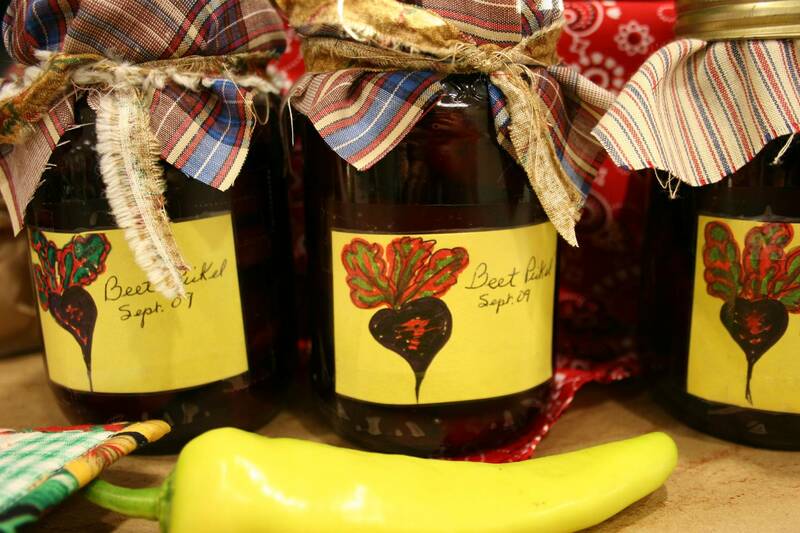 In the country store, volunteers sold homemade salsa, pickled beets, honey, pickle relish, bars, more pie and a whole lot of other homemade goodies in addition to garden-fresh produce. 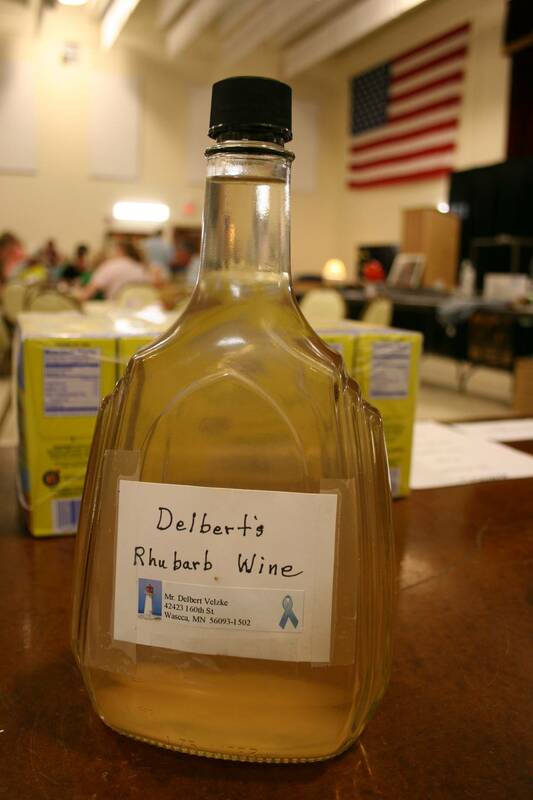 Delbert's Genuine Rhubarb Wine fetched $45 at the live auction. His grape wine sold for $50 and his plum wine for $25. It's always a hit. The silent and live auctions offered yet more tempting culinary delights like one-gallon bags of Bonnie Borchert’s “Best Ever Caramel Corn,” which sold for as much as $50; Delbert Velzke’s ever-popular homemade wines; and black walnuts from Elmer Fuchs’ trees. Dave Becher's two lady bugs drew winning bids of $30 and $35. But this event features much more than crowd-pleasing foods. It also highlights the artistic talents of those who support Cannon Valley Lutheran High School. Evelyn Meschke donated dainty crocheted doilies. Jamie Hays brought her colorful butterfly art. 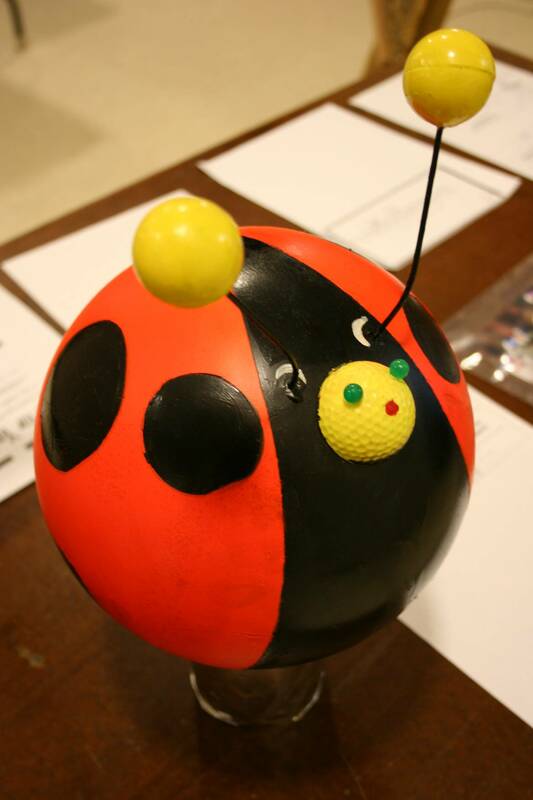 Dave Becher contributed his quirky garden art lady bugs made from recycled bowling balls. This shows just a portion of The Lord's Prayer fretwork. And then there was The Lord’s Prayer that Bob Kuschel crafted from white birch and Minnesota black walnut. 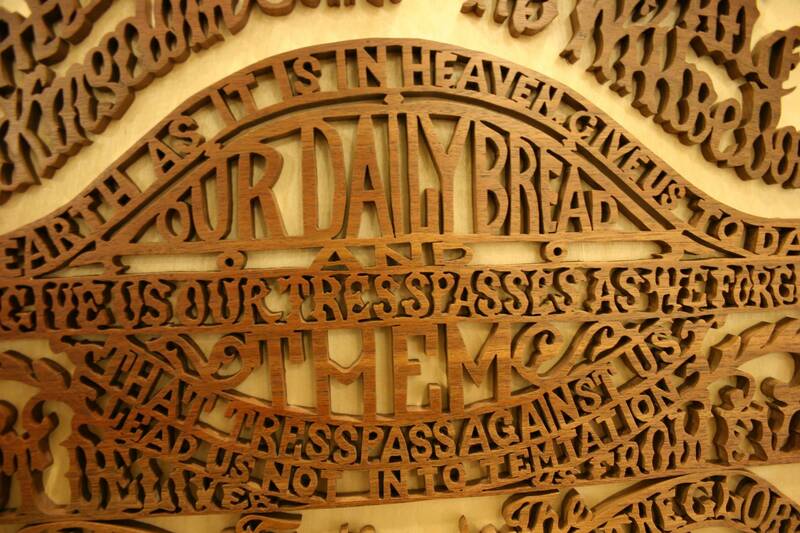 He carefully sawed every word of the prayer, letter by letter, to make this fretwork piece. This was his 24th creation of the “Our Father” prayer, following a pattern used by his father many years ago and only recently rediscovered, according to CVLHS art teacher Barb Bruns. The artwork made by the elderly Kuschel sold at Saturday’s live auction for $275. I was impressed by the skill and talent invested in creating this outstanding piece. 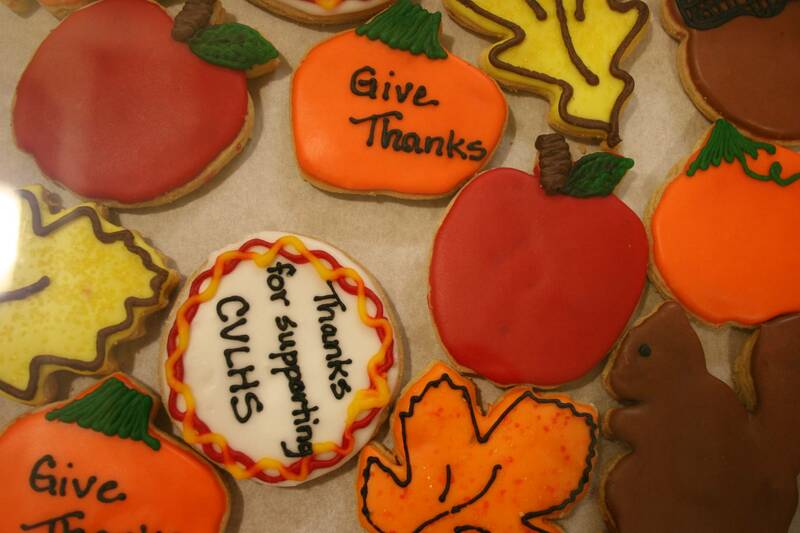 One dozen of Kathy Hallanger's fall-themed cookies sold for $40 during the CVLHS live auction. From catered meals to a week at a cabin to 50 bushels of corn for a corn burner to a pickup load of firewood to a half a hog to bird baths and a digital TV, the auction lists were packed with a variety of merchandise. While we bid on a few items, we didn’t end up with any winning bids. But that’s OK. We still enjoyed the evening of arts, entertainment and fine dining, Cannon Valley style. For more information about Cannon Valley Lutheran High School, go to www.cvlhs.org. 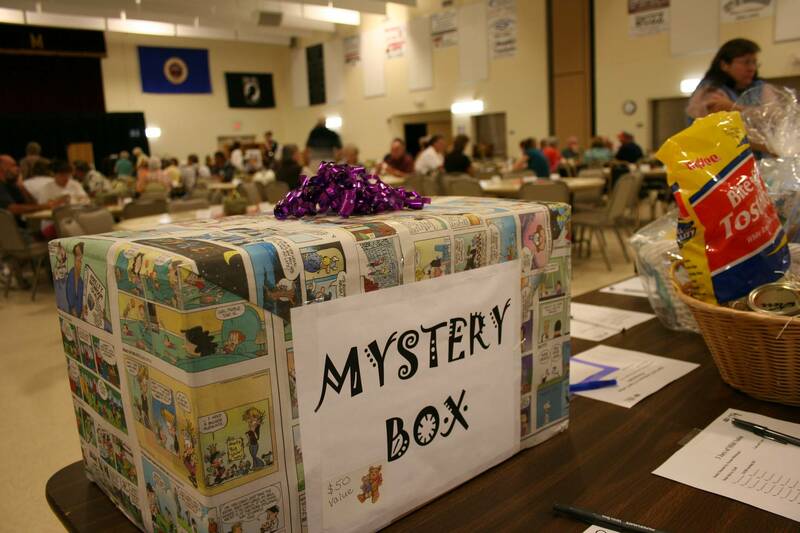 A mystery box at the CVLHS silent auction attracted plenty of attention, including mine. I guessed a microwave. Anyone care to reveal the mystery? Plan to attend a fundraising auction, dinner or festival in your area this fall. You never know what you’ll find while supporting a worthy cause. Looks like fun, we enjoyed a few fundraising auctions at our church. I remember Jon getting me one of Rose Kasma’s coconut cream pie for $40. (She was in her lat 80’s at the time) It was worth every bite. She was always so excited to see how much her pies went for! Yes, it’s amazing, Rosie, what some of these food items sell for at an auction. And I think you’re right, donors are curious about how much their donations, like Rose Kasma’s pie, will garner. I’ve seen pies sell for well over $100. But it’s all for a good cause. So, folks, open your pocketbooks and give generously. Readers, I’ve given Barbara permission to use my photo for promo materials at her southern church. I appreciate that she asked. The Lord’s Prayer fretwork that I photographed is truly a wonderful piece of art and craftsmanship. What was in the mystery box? Our organization in Indiana is having a Ladies Night Out in November themed for Indiana’s 200th birthday – Bicentennial. We have an antiques package being developed but have never done a mystery box and we’re kind of at a loss. Hope you see this and can offer some ideas. Hope to hear from you! Thank you very much. Please email me directly. Sharon, I’m sorry, but I have no idea what was in the mystery box. I was only attending and photographing and was not part of the event itself. Good luck with yours. I would like to know what was in the mystery box. My friend and I have considered doing one for a silent auction to raise money for foster children in our area. Anna, I’m sorry but I can’t answer your question. I only attended and photographed this event and had nothing to do with the planning of it.